There are times when you are working on an old piece of equipment and you have something rusted badly. It may come as a surprise to you but the rust can easily be removed by an electrolytic process that using electricity basically pulls the oxygen atoms out of the rust and leaves the iron behind. It actually removes very little, if any of the iron. A side benefit is grease, paint and other crud is also removed or perhaps it is better to say it is separated from the metal part leaving you with an incredibly clean part. This is the favorite method of tool collectors, assuming any paint on the tool is not valued. The basic process is to use a battery charger and hook the negative side to the part you want to keep and the positive side to a waste piece of iron. You are basically moving the rust from the metal hooked up to the negative side to the metal on the positive side. The two cannot touch or that would short out your battery charger and shut it down if it is a good one, or damage it if it is a not so good one. In order for current to flow you suspend both pieces of metal in a solution of water and washing soda from the laundry aisle of your local supermarket. In my case I had a badly rusted carburetor from a tractor. I took a plastic tub and clamped a piece of re-bar in each corner and tied them all together with regular copper wire. The positive lead from my battery charger was clipped on one of the pieces of re-bar above the lip of the tub. 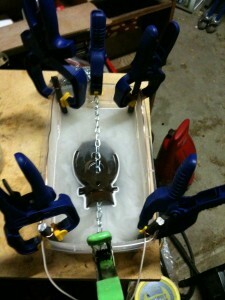 I took a piece of chain and suspended the carburetor in the middle of the tub. I then filled the tub with water and added a cup or so of the washing soda and turned on the charger. A day later the carb was as clean as the day it was cast. You can tell it is working by the bubbles coming off the metal After this picture I added more water so the piece was completely covered. Next time you have a rusty part to clean up, give it a try you will think it’s magic. I’ve even read online of people doing large items by building a wood frame and lining it with one of those blue tarps, you just need more sacrificial electrode material, more time and a bigger power supply. There is a good write-up here with more details.